Although upwards movement remains below the invalidation point so far I do not think it is over. This upwards movement is part of a second wave correction one degree higher than I had previously expected. 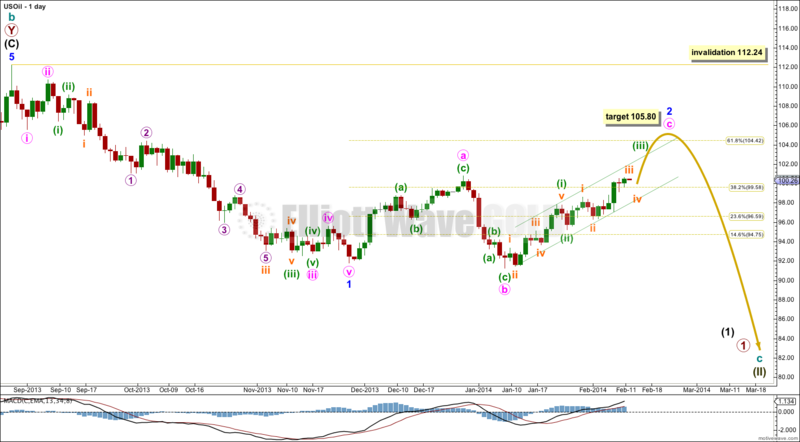 Overall I am expecting a continuation of upwards movement for a few days yet to about 105.80. Minor wave 2 is most likely continuing as a flat correction. Minor wave 3 has not begun. Within the expanded flat minute wave a subdivides easily as a three. Minute wave b is ambiguous. Here I am seeing it as a three where previously I had seen this movement as a five. Within minor wave 2 minute wave b is a 106% correction of minute wave a so this is an expanded flat correction. Expanded flats normally have C waves which end substantially beyond the end of their A waves. At 105.80 minute wave c would reach 1.618 the length of minute wave a, and minor wave 2 would be just above the 0.618 Fibonacci ratio. When minuette wave (iii) within minor wave c is complete then we may draw a parallel channel about minute wave c using Elliott’s technique. For now the best fit channel drawn here will do. 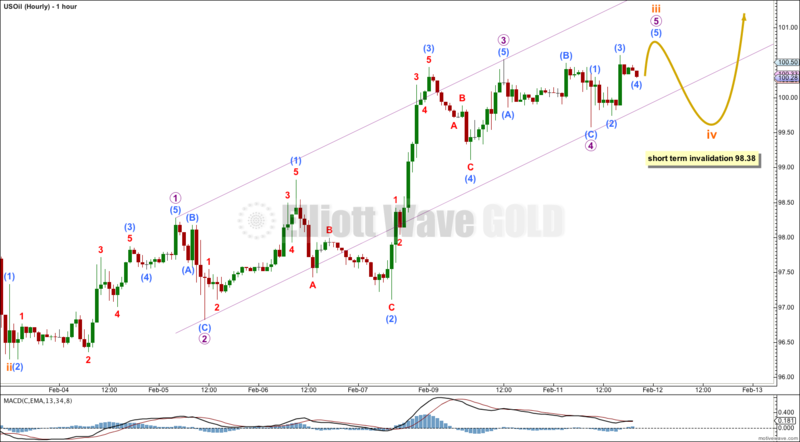 I would expect minute wave c to remain within its channel. When the channel is very clearly breached by a full daily candlestick below and not touching it then we would have trend channel confirmation that minor wave 2 is finally over and minor wave 3 downwards is underway. Within minor wave c minuette wave (iii) is incomplete. Within minuette wave (iii) subminuette wave iii is close to completion. Following that subminuette wave iv may not move into subminuette wave i price territory below 98.38.